Corsair last week started to sell its first Vengeance RGB memory modules, equipped with full sets of RGB LEDs that can change their colors using OS software. 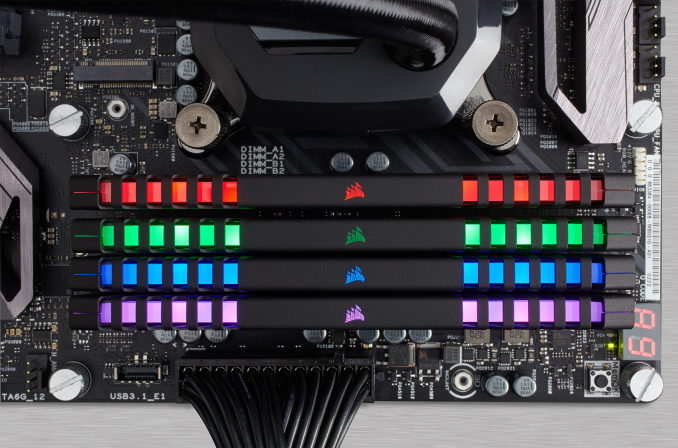 Right now Corsair offers DDR4-2666 and DDR4-3000 modules, but eventually we expect the Vengeance RGB lineup will be expanded. 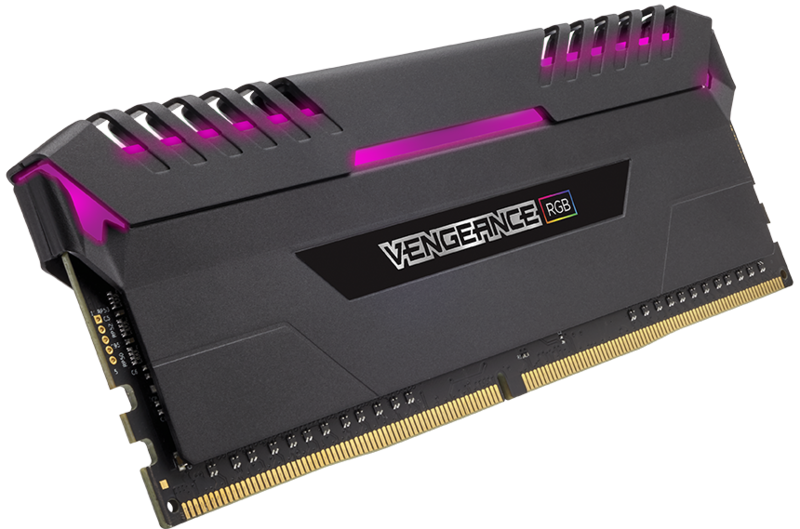 Just like other Vengeance memory modules, the Vengeance RGB DIMMs are based on Corsair’s custom PCBs as well as preselected ICs. The modules come with aluminum heat spreaders featuring RGB LEDs that can change colors dynamically using the Corsair Link software, allowing users to synchronize colors of RGB lighting of their DIMMs and specific motherboard brands. Lighting of each module can be controlled separately as well. 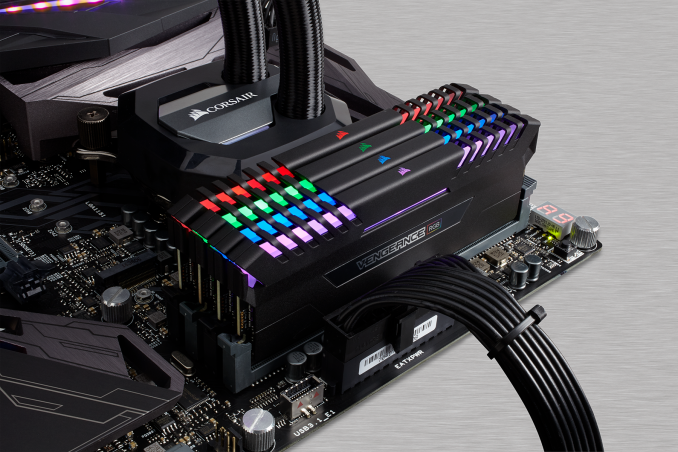 The lighting of the Vengeance RGB can also be controlled using GIGABYTE’s RGB Fusion app and Corsair states that eventually other producers of LED-controlling software are expected to follow. At first, Corsair will offer 16 GB dual-channel as well as 32 GB and 64 GB quad-channel Vengeance RGB kits consisting of two, four and eight 8 GB modules (they are based on 8 Gb DDR4 ICs), respectively. The DIMMs are rated to run at 2666 MT/s with CL16 18-18-35 timings and at 3000 MT/s with CL15 17-17-35 latencies. The DDR4-2666 modules feature 1.2 V power supply, whereas the DDR4-3000 DIMMs require the higher DDR4 standard of 1.35 V.
At present, Corsair’s Vengeance RGB memory modules are equipped with XMP 2.0-compatible profiles, optimized for Intel X99, Z170 and Z270 platforms. Eventually Corsair plans to expand the lineup with something faster than DDR4-3000. In addition, Corsair intends to announce AMD Ryzen-compatible Vengeance RGB DIMMs as well “soon”, but the company does not disclose timeframes or specifications of the upcoming products. It is noteworthy that the non-RGB based Vengeance monochromatic LED modules announced last year are now available at up to 3466 MT/s. 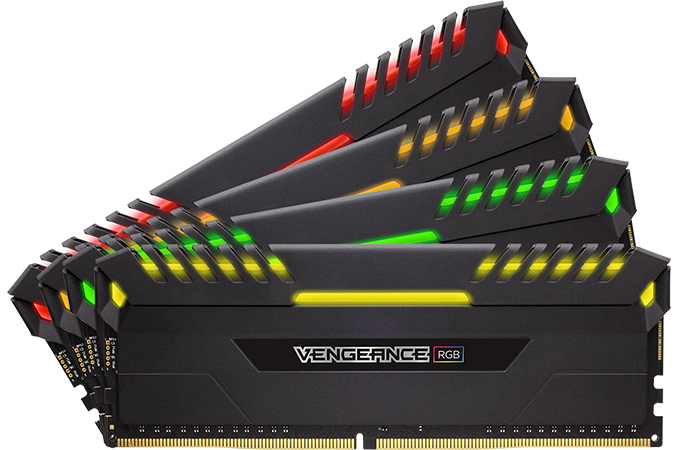 Prices of Corsair’s Vengeance RGB DRAM kits depend on specifications and capacity. Memory chips have risen in price compared to a year ago, and on top of this, companies like Corsair will charge a premium for customizable RGB lighting. But I have more objects in my home than just a chair. Products that lack Zen are a no go this year , Corsair totally missed this boat.